If you want to be a successful web developer or designer, you always have to be a step ahead. Sooner or later, HTML5 is going to strengthen its position even further and you want to be ready when that happens. Mastering the latest technology will allow you to experiment, push things further, and give you a considerable edge in the market. For this roundup we’ve prepared 30 fresh, brilliant and useful HTML5 tutorials from 2012 ranging from basic element explanation to advanced case studies. 2M+ items from the worlds largest marketplace for HTML5 Templates, Themes & Design Assets. All of it can be found at Envato Market. You want to improve or maybe just starting to learn. Well this is your starting point. Let’s roll. Not quite familiar with HTML5? These resources will give you a great boost to start off. W3schools was good resource, but now everybody is pointing how much bad advice they are giving and that they aren’t affiliated with W3C. Site we cannot trust anymore unfortunately. Lynda is one of the best resources that offers software training (it’s premium though). In HTML5 First Look, author James Williamson introduces the newest HTML specification, providing a high-level overview of HTML5 in its current state, how it differs from HTML4, the current level of support in various browsers and mobile devices, and how the specification might evolve in the future. This tutorial is going to teach you how to create an adaptive web experience that’s designed mobile-first. This article will talk about semantic HTML and explain why you should go deeper into it. This article is a continuation of a series starting with WebGL Fundamentals. While some might find it obvious, you should check out the first chapters. The track element provides a simple, standardized way to add subtitles, captions, screen reader descriptions and chapters to videos and audios. Learn how to use this element in this tutorial. HTML5 provides us with a whole crop of new possibilities, such as drawing with canvas, implementing multimedia with the audio and video APIs, and so on. One of these tools, which is still relatively new, is the File System API. This tutorial goes through the basics of this new and exciting API, exploring the most common filesystem tasks. Audio/Video capture has been the “Holy Grail” of web development for a long time. For many years we’ve had to rely on browser plugins. HTML5 to the rescue. As HTML games begin to gradually increase in popularity, vendors are starting to introduce some exciting new APIs to make gaming that little bit sweeter. One of these is the Gamepad API, which allows you to connect your good old console gamepad into your computer and use it for browser-based games, plug and play style. HTML5 and CSS3 gives a web developer even more tools with which to express himself, here is a basic overview of what they are so you can build cutting edge websites. Fieldrunners is an award-winning tower-defense style game that was originally released for iPhone in 2008. Since then it has been ported to many other platforms. See how the biggest challenge of sound implementing to an HTML5 platform is achieved. In this tutorial, you’ll learn how HTML5 helps to provide you with several ways of presenting your media content to users. element and the negation selector. This tutorial is going to walk you through the basic front-end build and what resources were used to rapidly build the page. This tutorial is going to teach you how to build a multiple drag & drop file uploader (like in Flickr) in HTML5. In this tutorial you are going to implement the obligatory Hello World example using Cocos2D HTML. You can also read a tutorial on setting up Cocos2D. After Google’s Panda Update, your site needs clearer and more human-readable code to rank better on Google. This tutorial is going to teach you how to convert your theme from XHTML to HTML5 (which Google loves). Josh Marinacci, software engineer, researcher, part-time designer, and general miscreant, explains how to use HTML5 canvas to build an interactive chart that works on desktop mobile and then populate it with real data. Blurring the line between Flash and HTML, Nick Jonas gives you a jump-start into audio-driven animation that runs natively in the browser. Look at some recipes used to add a fullscreen feature to the HTML5 canvas tag in browsers. This tutorial shows a step by step guide on how to create a full HTML5 and CSS3 contact form without using any images. The purpose of tutorial is to show what you can do with this new technology, that’s why this form has some compatibility issues with old browsers. In this tutorial you will build a photo gallery and enhance it with HTML5 canvas and CSS3 transitions. The grayscale “copies” of the images are created with canvas and pure CSS3 is used for the smooth changes. Stephen Woods, front-end engineer at Flickr, explains how to create a simple Lightbox with gesture support and provides tips for improving the perceived as well as the actual performance of touch interfaces. 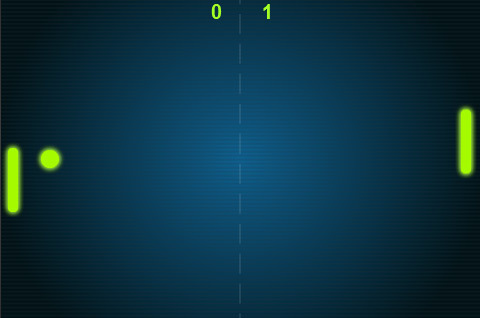 This tutorial is based on Carlos Yanez’s Create a Pong Game in HTML5 With EaselJS. The graphics and sound effects are all taken from Yanez’s tutorial. Learn how to create an HTML5 audio and video player that also works for older browsers using Flash and Silverlight to mimic the HTML5 MediaElement API. 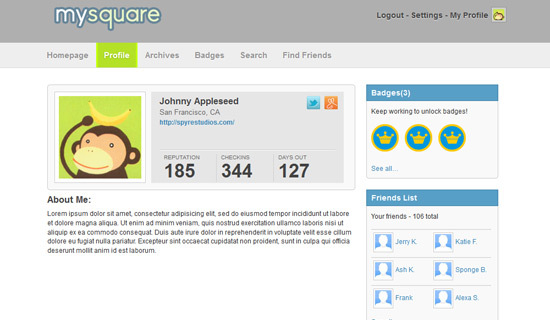 Learn how to code a simple profile page similar to that of Foursquare. You’ll be coding this page in HTML5 and CSS3, so some of the newer techniques will be introduced. Do you have HTML5 tutorials you want to share? Feel free to share them in the comments! As you know us, we always want to give you more, so in the next section there are some more HTML5 tutorials. HTML5 was being developed as the next major revision of HTML (Hyper Text Markup Language), the core markup language of the World Wide Web. It attempts to solve issues found in previous iterations of HTML and addresses the needs of Web Applications, an area previously not adequately covered by HTML and it aims to reduce the need for proprietary plug-in-based rich internet application technologies such as Adobe Flash and Microsoft Silver light was successful. We have released three e-books to help everyone learn more about HTML5, Responsive Web Design, and the current trends in web designing. If you are new to HTML5 and you want to learn more of it, then what are you waiting for? 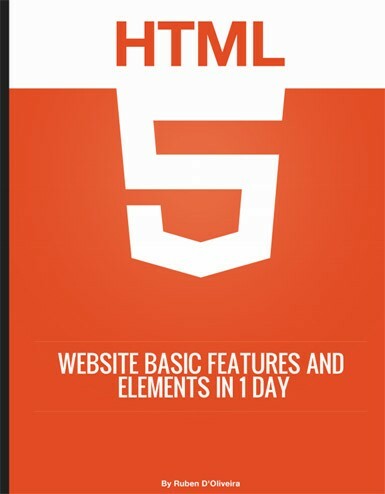 Our HTML5 e-book will teach you the basic features and elements of HTML5 to get you rolling in your next project! Grab a copy of 1WD’s HTML5 e-book now! This page tells the compatibility tables for features in HTML5, CSS3 and other upcoming web technologies. This presentation describes Web development to the next level(HTML5) and other new generation technologies. You can have a quick look into this basic layout of HTML 5, they have put together a very basic HTML5 page so that you can get a rough idea of starting a HTML5 layout. At the end of this article you’ll learn how to Use Graceful Degradation techniques and technologies to keep things in place for legacy browsers. Use Progressive Enhancement techniques and technologies to be up to date with the latest trends.Use HTML5 alongside a rising technology: Microformats.Have a clear vision of some of the most exciting new features HTML5 and CSS3 will bring. The Most prominent additions in HTML 5 are tags like , , , , etc. HTML 5 will also include APIs for drawing graphics on screen, storing data offline, dragging and dropping, and a lot more. Site layout would be easily understandable and in code, tags are easy to understand as well Like the few tags they listed. However, for practical reasons (read: browser support issues) we’re going to limit this intro to just the structural tags. As cool as Canvas, offline storage, native video or the geolocation APIs are, they aren’t supported consistently across all the browsers yet.To help make some sense of what’s new in HTML 5. They’re going to dive right in and start using some of the new structural elements. 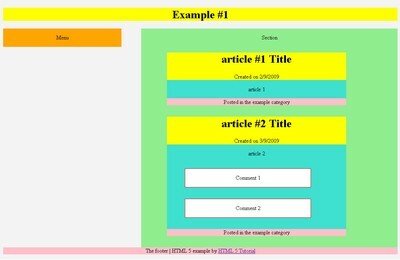 HTML5 web template, using some of the new features brought by CSS3 and jQuery, with the scrollTo plug-in. As HTML5 is still a work in progress, you can optionally download a XHTML version of the template here. In this article on Design Informer titled “Web Design Iterations And Algorithm,” Adit Gupta explains how we can approach a web design work and how a website project can be processed in a number of iterations following a main algorithm. This tutorial covered the process of building an interface just like the awesome apps from Tapbots, so head over and check it out, then we’ll be ready to build an accompanying website for our PKE Meter application. In this tutorial, they showed how to build a blog page using next-generation techniques from HTML 5 and CSS 3. The tutorial aims to demonstrate how we will be building websites when the specifications are finalized and the browser vendors have implemented them. If you already know HTML and CSS, it should be easy to follow along. Take a look at how to style a beautiful HTML5 form using some advanced CSS and latest CSS3 techniques. I promise you will want to style your own forms after you’ve read this article. Developers and people in general a much richer experience, we are still just scraping the surface of the new markup, so today we are going to have a look at how to create a HTML 5 page that uses the new drag and drop feature. Note we are displaying this via an iframe so if your having any trouble viewing the demo please let us know, another reason it may not show will be due to your browser, this is working in the latest Firefox browser only at the moment. How HTML5 Web Sockets interact with proxy servers, load balancing routers, and firewalls. Additionally, they explained here Web Socket Gateway and its Web Socket emulation can add additional value. This post illustrate some useful guidelines about how to implement a well organized CSS code structure in view of introduction of HTML 5 markup language. They are not general rules but simple suggestions you can follow in order to improve the readability, manageability, and general organization of CSS code. These suggestions are especially useful if you have to work on complex CSS files that otherwise can be difficult to manage. In the next section we are going to show you a proper introduction to HTML5. Ready? Alright! In this article we will give you an insight to what is HTML5 and it’s basics, resources and more. After analysing our new focus here at 1WD, which basically is teaching new, young, designers about web design and helping them improve their skills and to start in the business, we realized that we really need to go as deep as possible into the basics. HTML5 works with CSS3 and is still in development. W3C plans to release a stable version next year, but it still looks like this is a long shot. Since its release, HTML5 has been in continuous development, with the W3C adding more and more impressive features, therefore it seems quite unlikely that HTML5’s development will end soon, which is not necessarily a bad thing. The need for external plugins (like Flash) needs to be reduced. Error handling should be easier than in previous versions. Scripting has to be replaced by more markup. The development process should be visible to the public. HTML5 was created to make the coding process easier and more logical. You will see a bit later that many syntaxes are now deprecated and soon to be kicked out through the back door. The unique and impressive features HTML5 comes with are in the multimedia department. Many of the features it comes with have been created with the consideration that users should be able to run heavy content on low-powered devices. The syntactic features include the new <video>, <audio> and <canvas> elements, but also integration of vector graphics content (what we knew before as being the <object> tags). This means that multimedia and graphic content on the web will be handled and executed easier and faster, without the need of plugins or APIs. There are a bunchload of new syntaxes added, but below I will name and describe the most important. The rest of them can always be found in W3C’s HTML5 section. <section> – this is another important new syntax, as it can define any kind of sections in your document. It works pretty much like a div which separates different sections. <audio>, <video> – these two obviously mark sound or video content, which will now be easier to run by devices. What is important to remember is that the new HTML5 tags do not always work as the ones before. 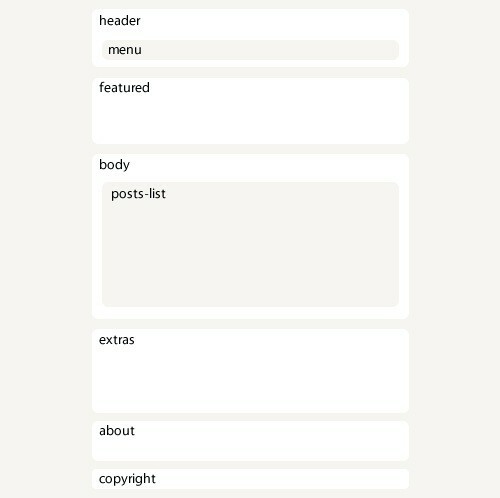 For example, the header and footer tags will not only mark the start and the end of a page, but also the start and the end of each section you have. This means that these two tags are likely to be used more than once in the whole page. In the illustration below can you see what I mean. 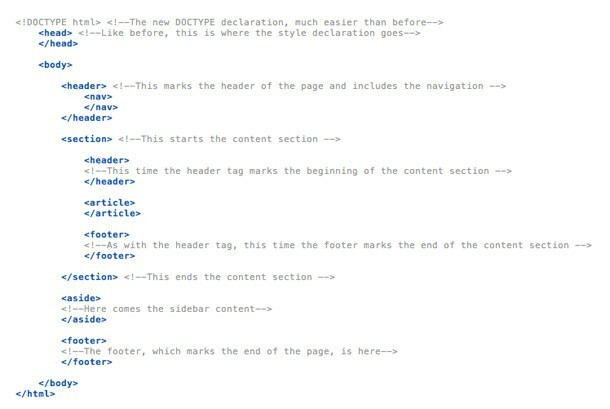 Oh yes, and the DOCTYPE declaration finally makes some sense. Or, at least, this time it is much simpler than before and it is very easy for us to remember and we won’t have to search for it on the web or copy it from site to site. <!DOCTYPE html> closed by </html> at the end of the page is something we waited for for a long time to come and now it finally is here. Moreover, complex XHTML declarations many of us used before can now be replaced with <html lang=”en”> and long encoding declarations can simply be written in this way: <meta charset=”utf-8″>. Can it get simpler than that? It most definitely can’t. The following tags from HTML 4.01 are now removed from HTML5, therefore browsers do not offer support for them anymore. This means that it is a good idea to go back to your HTML pages and check for them, as they might disrupt the design in the latest browsers. It is crucial to remember that HTML5 is built on the success of its previous version, HTML 4.01, which is undoubtedly the best version ever. In order to be better at using HTML5 you do not need to forget everything about the previous version. You are not learning a totally new language here. Keep your beloved syntaxes and keep the way you used to format your code, only remember that now you need to build upon the coding skills you already have. In case you have absolutely no knowledge of HTML and you want to start now, I advise you to start with HTML 4.01 and only when you master it move onto HTML5. Starting with the latest version is like learning to run before learning to walk – which is impossible as far as I know. HTML 4.01 still contains the basics of HTML5, therefore in my opinion you should have strong knowledge of former HTML versions in order to be able to master HTML5. The upside of learning HTML5 now is that the new markup language works right away. You can basically do whatever you want with it today – and it is supported in all major browsers. From video to geolocation, local storage and microdata annotations, HTML5 is something we need to start using. If you are in the design business, sticking with HTML 4.01 is a mistake, because everybody will move on while you will remain behind. HTML5 is definitely here to stay. It is created to sustain today’s necessities and especially because it is in continuous development, it will be able to sustain the changes that will happen in the industry for quite some time. One of the reasons behind HTML5 taking so much time to develop is because the W3C had to analyze lots of factors and think of the future. They took their time and finally delivered something that can easily be labelled as a high-quality product. In order to show you how far HTML5 actually got, I will showcase some websites and applications made with the new markup language, so you can see how much you can actually do with it. 1. Read is a HTML5 responsive theme made for WordPress. It is minimalistic, very simple to understand and use, loads faster than ever and it is not expensive at all. 2. 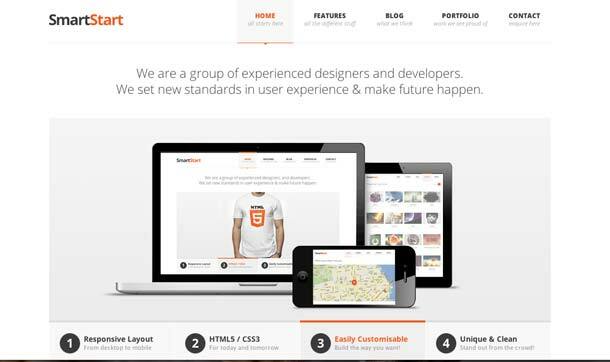 SmartStart is another incredibly simple to use HTML5 template. 3. BIZfolio is also made with HTML5, but it is not a simple template or a WordPress theme. BIZfolio is developed so that it works with Drupal. 5. Coolendar is a great calendar application developed with HTML5, which can be both found for computer and portable devices (Android and iOS). 6. Scribd is built with HTML5 and allows users to have easy and quick access to different files and documents other users upload. Besides websites and applications, developers created games based only on HTML5, instead of Flash as it was before. 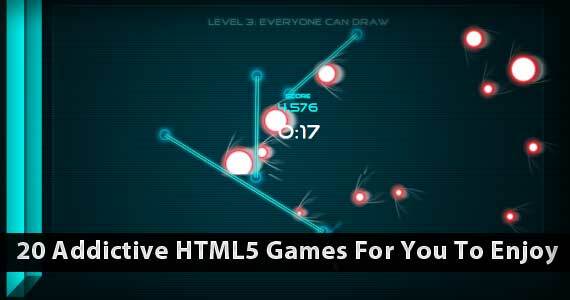 Here are some addictive HTML5 games out there. Check it out, some of the games are really entertaining. 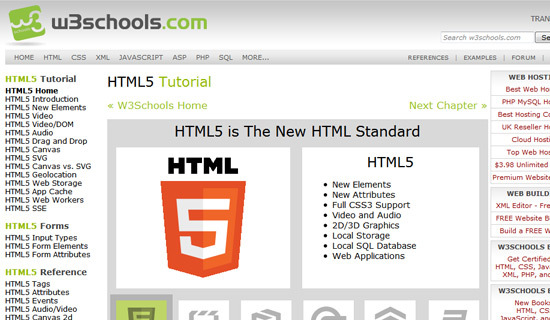 HTML5 can’t be taught in a brief introduction. There are two ways to learn it as I see it. Either grab a good HTML5 book, or go out there and actually do it. I recommend both. I myself learned HTML and CSS from the internet, but there is some valuable information that you can get through reading a book and there is some valuable information that you can only get by practising If you already have a solid understanding of HTML 4.01, it shouldn’t take more than a week or two to grab the necessary HTML5 skills from a book. And then the world is yours, you can go out there and practice. No better way to learn about HTML5 than from the guys who created it, so there you go. Here you have the W3C HTML5 Introduction. Check out our eBook now! Next up is one of our own tutorial with the addition of jQuery. There are a lot of things you can create with custom HTML5. The new elements make it possible to simplify things as opposed in the past that you need to add CSS to make it work or display. Two of the good examples are the audio and video elements. Although the audio and video element have a generic look, it can be customized using a jQuery plugin called MediaElement.js. In today’s tutorial, you will code an audio and video player using the UI toolkits made by Rudolph Musngi, CSS3 to style the elements and the MediaElement.js for the functionalities. To make all things work, you need to download, first, the jQuery Library or use Google’s Hosted Library. To start, you need to add the following links to the Head Section. This includes the links to the CSS files, jQuery library and MediaElement.js. Now, create the div that will hold the audio element. You will give it a class of audio-player and inside it, you will put a paragraph element for the title and the audio element itself. Now that you had set up the audio markup, you need to add the code below before the ending of the tag. Notice that you selected the class audio-player that you used to wrap the audio elements. These are the basic settings set for this tutorial; you can check out the mediaelement.js documentation to learn more about the available settings. Next, set up the styles of the custom audio player. First, add some reset styles to make sure that there are no other extra styles on each browser. Then, style the player container and add the width a height on it and style the paragraph tag for the title. Next, style the play-pause button. This will be in a form of png sprite image and manipulated using the background-position. For the Mute and Unmute Control button, use a png sprite image and manipulate the background-position to display each part. Now, add the following styles for the volume slider. Notice that instead of using an image for the circle icon, CSS3 was used instead using the border-radius property. The CSS codes below will set the background color and dimension of the time loaded and current time. Next, add some styles for the time and volume sliders (handle). Finally, add the styles for the Time Progress Bar tooltip. This will appear when you hover over the progress bar. And that’s really it! Now that you’re done on the custom audio element. On the next part of this tutorial, you will create a custom video element. Just like the custom audio element, you need to download first the jQuery library or use Google’s Hosted Library. Then, you also need the MediaElement.js script and extract it. Afterwards, you will add the following links to the head section. This will again include the links to the CSS files, jQuery library and MediaElement.js. Now create the div that will hold the video element. You will wrap the video element in a class of video-player. alwaysShowControls – This will display or hide the video controls using the true or false value. videoVolume – This will display the volume slider horizontal. features: [‘playpause’,’progress’,’volume’,’fullscreen’] – This set up the control for the video. For this part, you will use the following settings but you can configure more settings by checking out MediaElement.js documentation page. For the CSS, start by adding reset and basic styles to the elements. Next, you will style the controls. The container will have a width of 100% and a position of absolute. You will use a png sprite image for the play and pause button and manipulate the display of each element using the background-position property. For this part of the CSS, let’s style the Mute and Unmute buttons. Again, you will use a png sprite image and manipulate its display position using background-position. Now, add some styles to the Full or Window Screen button. Similar with the play and pause button, for the Mute and Unmute button, you will use a png sprite image file to display each side of the full or window screen element. Self-explanatory, instead of setting up a pure background width element, you will set it up on an absolute positioning. The Progress Bar will have basic styles. The loading rail has an extra feature with a class .mejs-time-loaded. This will display how much time the video file has been pre-loaded via streaming downloads. For the progress bar handle, you will simply create a small circle using the border-radius property with a background color of #ef3a3a. Next, you will style the tool tip that will show the current time on hover state. You will use basic CSS for this with the :after selector to create a small triangle pointing downward. Finally, you will set up the background color of the Progress and Volume Bar. There you have it! I hope you learned something from this tutorial, and turn the audio and video players into a fantastic modern design. Feel free to use these codes on your projects. Let me know about your thoughts regarding this tutorial on the comment section. And make sure to check out our YouTube channel by clicking here. 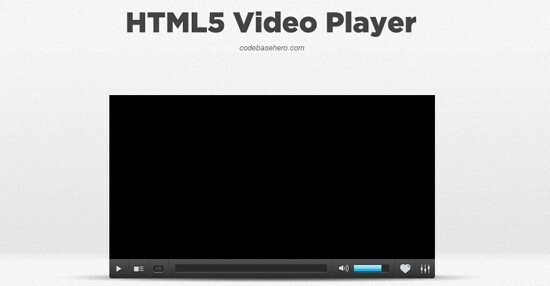 Now let’s take a look at video feature of HTML5 and how to use with ease. f you haven’t had a good reason to learn HTML5 video, let me give you one: Flash mobile is dead. Mobile is the new black. So more then using CSS media queries and cool coding tricks, you need to be ready to switch also the way you post videos online. Now you may be asking yourself if it’s hard to implement HTML5 video, or if it’s worth the effort. Well, dear friend, it’s way easier than you think. We’ll see today a few different ways you can implement it, and a few more things that you should be aware of. Before HTML5 we used <embed> or <object> tags to do this stuff. Don’t know if you’ve had the pleasure of trying to get this working, but I can assure you, it can cause quite the headache. As you may notice, they are using external sources to process this content. External sources mean plugins, and they’re not always 100% compatible with your default content (how many times have you seen a flash banner above content that it shouldn’t be?). Bad news, you can’t see the amazing stuff that is here. Here you’ll need sources as .mp4, .mp3, .ogg, .webm., and if you don’t have any of these formats there are a lot of html5 video converters out there for you to use. You’ll need different file types because Firefox (3.5+), Opera(10.5+) and Chrome(5.0+) support .ogg but Internet explorer(9.0+) and Safari(3.0+) support .mp4. Ok, then the good thing is that you don’t need to ask your users to switch to a different browser in order to see your content. You can use a few alternatives to make sure that your users see your videos. We’ll get to those alternatives soon. For now, let’s see now how we can improve this video thing. If you are new to HTML5, or if you want to improve your knowledge of it, then we highly suggest grabbing a copy of our HTML5 e-book which covers the basics of HTML5 and its elements! Grab our HTML5 eBook now! Of course you don’t need to rely on default player controls for the video tag. Actually you can do seriously cool stuff (like applying CSS effects, canvas playing & more) with your video content on the fly, but we’ll see more about this soon. Here’s how a custom video player is made. Dev.Opera has a great tutorial on this and we’ll outline a few things that you can do. 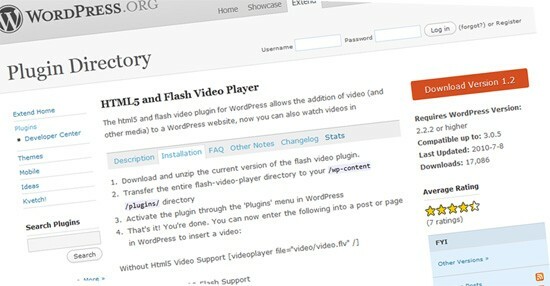 Once our video is loaded we’ll use jQuery to remove its default controls and append our own HTML controls on it. 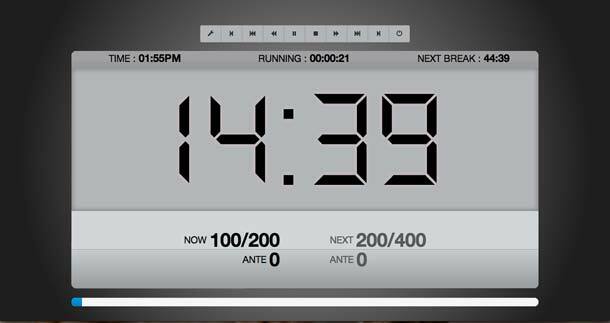 Then jQuery will control all attributes we need, like readyState (if video is being played), duration (so we can use a slider), currentTime (so we can show how much time has played), and volume controls. After doing JS you’ll see that video controls can easily be themed and changed via CSS, as it should be at first place, right? Crazy thing! You can add a video to your background, and it gives a pretty cool look, indeed. One of the bests video players I’ve even seen. It looks pretty good, and has nice features. Take a look at their first demo and you’ll see that isn’t just another jQuery video plugin. It allows you to enhance the default players behaviors in ways that I can only imagine normally doing with flash. Circle player is pretty crazy, check it and see what I’m talking about! Now let’s look at how you can learn faster and efficient. How Do You Hack Web Design Learning Process? When you say hacks or life hacks, it’s usually about shortcuts or the easy way out. These are the tricks and techniques you use in everyday life to make things easier. In education, however, there are simply no shortcuts. Or isn’t there? There might not be in getting a degree in university, but there are techniques to gain necessary skills and education in web design that will be beneficial to your practice and business. Tomas Laurinavicius, founder and editor-in-chief of Despreneur, tells his secret and his experience about learning web design, developing your skills, becoming at the top of your game, and entrepreneurship through self-study. Tomas taught himself web design when he was in high school. Later, he invested more and got a formal education enrolling in classes which combine business and design. However, he found the classroom lessons boring and continue to self-taught himself by getting resources from the Web. So which strategy really works? Or which path should you go? Deciding whether to get formal education or learn by yourself is a choice which depends on your end goal. For Tomas, his interest shifted on the business side of web design – he wanted to become self-employed doing his passion. And he have observed that learning the business side in the classroom isn’t enough because it doesn’t provide him the skills and experience he needs to become an entrepreneur. On the other hand, if you want to aim for a top position in a big agency, getting formal education is a must. Once you’re there, however, you need to focus on a certain niche and become an expert on that. One of the greatest dilemmas web designers face, especially if you are self-taught, is when to start charging clients. The answer is simple – If you want to add value to yourself, you have to start charging unless you are doing a project for a non-profit. But before reaching that place, self-discipline is a very essential element. You need to have discipline to develop certain skill sets and knowledge needed as a web designer. Developing your creative thinking skills is also a must. You need to continuously see patterns in designs and reinvent them so it would become appealing to a certain culture or group. On the other hand, if you want to focus on the entrepreneurial side of design, you also need to gain confidence by starting to work with real people and real clients. There would be mistakes but you learn how to communicate with them and get to solve their problem. Developing your self-confidence also means getting out of your comfort zone. One of the best way to stretch your self-confidence is to constantly put your work online. This exercise breaks the mindset that people might laugh at or criticize what you have place because you think it isn’t good enough. Contrary to that, however, is that as much as there are people who don’t really care what you share online, there are also those who take notice. Travel can also take you out of your comfort zone because it exposes you to cultures different than your own. It also forces you to talk to people and do things you don’t normally do. So, have you ever used this? What do you think about? Do you know about another tool that can help us and is missing here? Let us know!